Karandia is a massive continent and it hides a lot of secrets. Throughout the known history different areas of this land suffered a series of unusual disasters, which left behind strange long-lasting effects. Crystal dust desert in Tamir, littered with massive formations of crystals, where no plants grow and no wildlife dwells; The Ashen waste in Principalities, which changed its residence into arcane-filled abominations; Basin of immortality within the Red python basic, where as rumors say death has no power over mortals; Ruby beads isles, where plants, animals and even humanoids gain red pigmentation if stay there long enough - these are just a few examples of active anomalies in Karandia but there are many more of them. For thousands of years scientists and magicians from different nations explored and studied these areas, building a lot of theories about their nature and origin. Most of these theories point out at the obvious involvement of magic, altered or empowered by some unknown artifacts. Only a few theories try to explain the existence of anomalies as unstudied natural processes but in the middle of 110th century these theories lost their relevance when a certain object had been obtained by scientists of Tamir, proving in theory and in practice that creation of such anomalies can be achieved artificially. The early history of Tamir is very poorly documented. While many suspect that Tamir royalty hides the truth for one reason or another, the public is left with vogue, story-like interpretation of events from that time. This obscure period of Tamir’s history begins after Boltok refugees arrived to Tamir peninsula and is concluded by the arrival of wanderer Kern and his victory over the aboriginal nation of Sina four decades later. Numerous stories of Tamir’s war against Sina and the fable about wanderer Kern can be found today in many libraries or Tamir and outside of it, but how much of them is truth and how much is fiction – is an open question. However to the historians and scientists of the world it is clear that the event that happened in the end of that period might be the most significant in all of recorded history, thanks to the clues it provided about the origin of Karandian anomalies. The fact of Sina’s existence is undeniable – even if someone would disregard the stories and fables of Tamir, the old records about them were found in literature and archives of the ruins of Damani and in libraries of Dornia. In both of them Sina was described as a nation of dark-skinned humans who ruled over Tamir, had a strange culture of savage rituals and traditions and who refused to negotiate with outsiders. Orcs from Northern Tamir, who were never a part of the Green tide also tell numerous stories how their ancestors encountered Sina. In these stories Sina was presented as hostile, militarized society who often raided orcish lands to collect slaves. Thirty-seven years after the Boltok refugees arrived to the peninsula and formed the new kingdom, in the end of the obscure period of Tamir’s history, Sina’s activity have no longer been registered neither in Tamir nor outside of it. This perfectly matches the fable of Kern, which tells about his adventure into the Kifir jungle where he created a colossal cloud of Grey mist that poisoned and killed most if not all residents of Sina’s capitol Seon. The archive of historical royal documents confirms that after that event Kifir jungle had been declared a restricted area and there was even enforced punishment for any attempts to trespass it. There also exist three royal orders to form scouting teams with mages able to cure the Grey mist’s deadly effect throughout the first half of 111th century. In first case the scouting party disappeared without a trace, in the second and third cases parties successfully reached the contaminated area and confirmed the existence of the Grey mist. The final document regarding Kifir expeditions have been signed two more centuries later and contains information about an expedition of a large royal army into Kifir jungle, with the purpose to scout regions to the South from Seon, out of approximate area of Grey mist. The added documentation tells about the complete defeat of the army with very little survivors making it out alive. It does not confirm a deny if the Grey mist still existed at that point as the army’s defeat was caused by an unknown S-class monster’s attack. After that event the restriction to enter Kifir jungle have been officially lifted but with a special addition – that Tamir kingdom would not carry any responsibility and would never send rescue missions into Kifir jungle. Histories suspect that this move was motivated by Tamir’s desire to find out what happens in Tamir but without the need to risk their own people. Adventurers, archeologists and treasure seekers from around the world would eventually do this job for them. As the fable of wanderer Kern states, after his return from Kifir jungle and declaration that Sina was destroyed, king Tovarn II refused to believe it and ordered a scouting expedition to venture into Kifir and confirm or deny this claim. The group of fifteen riders, led by prince Ronik reached Kifir but only two scouts made it back. They confirmed the Sina’s defeat and told about the Grey mist, which enveloped Seon and jungle around it. The same mist that, according to the fable, poisoned the scouts too and led to death of prince and most of his comrades. As fable concludes, the king was so infuriated by the loss of his son that he ordered to torture and even execute Kern. The following information comes from the documents that were widely spread all across the world by the scientific society. They briefly tell about Kern’s involvement into the destruction of Sina but they pay much more attention at technicalities, how he could manage such a feat. The Grey mist that he used is a powerful spell of death magic. It allows the caster to create a cloud of grey-ish, partly transparent mist which poisons any animal, monster or humanoid who inhales it more than once. The Grey mist is harmless to insects and plants, that’s why the jungle surrounding Seon did not die with its inhabitants. Grey mist’s size and duration directly rely on the caster’s power and do not require channeling. While unexperienced or weak death mages can create a cloud of mist that lasts up to 30 seconds, more experienced ones can make it up to 5-6 minutes and of much larger size. This significant detail igniting the interest of royal mages of Tamir to Kern’s magic. According to the fable, Kern’s Grey mist lasted for at least a month – the time that took him to return to Kortas plus the time that took the scouting party to reach the jungle. And if we take into consideration reports of the second and third royal scouting missions that took place a century later – the Grey mist still existed. Just one month was already too long. Even the most powerful magicians in history could not make anything like this, not with their own power, not with help of any other known enchanted artifacts. Not realizing it king Tovern II made a terrible mistake by executing Kern before finding out his secret. This did not stop the royal mages however. What a person can not tell - can be learned from their remains. That’s why with the king’s permission Kern’s body and belongings had been delivered to a secret laboratory for study. The goal of mages and scientists who got their hands on recently executed Kern was to figure out how did he managed to cast a seemingly well-known spell but with such unnaturally large area and extremely long duration of effect. First they examined his body. Kern had several cuts on his hands and across his torso and legs – researches came to conclusion that these were obtained while he was making his way through the dangerous jungle. There exist tools that allow to measure the potency of person’s energy pool so this was their next step. In Kern’s case nothing seemed out of ordinary at first – the measuring process confirmed a solid energy pool with a light taint of death energy – typical condition needed to cast spells of death magic school. The first strange discovery lied in Kern’s energy pool’s progression. It is a known fact that ethereal energy from a potent energy pool does not instantly disperse after the magician dies as it is not directly connected to the body’s biological functionality. When the body dies, energy pool remains but is no longer renewed, thus it slowly weakens until nothing is left. The process may take up to a week, but in Kern’s case everything was different. His energy pool weakened unusually slowly and fully dispersed several months later. Even stranger was the fact that the death energy did not show any signs of progression either. Normally death energy seeks to corrupt and consume the entire energy pool and needs to be fed with life energy to stop the process. To those affected by this energy it gets harder to do so when their body is weakened, but after death it is supposed to happen almost instantaneously. Next step was to find out why Kern’s energy pool behaved so strangely. Examination of his belongings didn’t give any clues at first – he wore simple clothes, had a small sum of money, several simple enchanted trinkets and an iron staff with a strange crystal at its top. The researches quickly came to realization that there was something very wrong about this crystal. Many magicians like to use energy crystals in their staves, wands or in trinkets. Energy crystals serve as extra sources of energy, allowing the owner to cast more spells than they would able to by using only their own energy pool. There are more types of enchanted crystals which can empower, prolong or even change the visual effects of spells but in any case they are supposed to hold certain amount of energy of their own. Kern’s crystal was different – it was hollow, void of any energy. Some researches suspected that this crystal could merely serve a cosmetic function, that Kern was too poor to buy a proper energy crystal. And this crystal would be simply shoved aside as useless junk if the subject of research did not hold just high importance. At closer inspection the researchers realized that they could not figure out where this crystal came from – it was made of an unknown mineral. It appeared to be highly resistant to any forms of physical or elemental damage, it did not react at any forms of energy channeled into or through it. Enchantment analysis didn’t give any result either. The secret of Kern’s crystal have been discovered during an accident. One of the researcher’s assistant, young orc Tomek accidently shoved the crystal off the table. The crystal wouldn’t break from such fall but the orc instinctively caught it before it reached the ground, rending his hand over its pointy edge. This is when the orc realized that something happened to him – he felt a strange connection between him and the crystal. A connection through blood. The secret of scars of Kern’s hands have been solved. During the following days several experiments have been performed and the results were astonishing! Through freshly spilled blood the crystal formed a direct connection to the person’s energy pool and would sustain it for as long as the person held the crystal. After the connection was established – any amount of energy channeled into the crystal somehow multiplied and returned to the caster, expanding their energy pool to abnormal proportions. During this effect no device for energy pool measurement could show the result – it was simply too high. After that two things could happened. If the person let go of the crystal the connection broke and their energy pool would return back to normal with the extra energy obtained from the crystal vanishing. But if a person tried to cast a spell while being infused by the crystal, the spell would consume all extra energy and would be empowered to a frightening degree. Several tests of spell casting with the crystal’s infusion caused massive damage to targets and structures around them. After several such incidents, some of which involved casualties among the research team, the king ordered to stop any further tests, to confiscate the crystal and to lock it up in a hidden chamber. The risk of even greater disasters happening if the artifact would be tempered with even more grew too high. Despite this, all of the researches who took part in the study of the crystal were rewarded and orc Tomek have even been granted a permission to give the artifact a name. Tomek chose to call it Sol after his beloved hometown in the North of Tamir. For three more years the crystal would remain hidden away and the extracted information was analyzed by Tamirian scientists. Soon, however, would happen an event that changed the history of the continent and would complete add more clues to the Sol crystals research. Three years after Sina’s downfall and the study of Sol crystal a grim news arrived to Tamir. After a crushing defeat on the shores of Principalities four decades ago the Green tide was reformed and began a new march to the South. New generations of orcs craved the glory of their grandfathers and began a new conquest against hated human kingdoms. This time their sights were set on Tamir peninsula and its new human kingdom. While hundreds of thousands of orcs marches through the main land of the continent, the king of Tamir gathered nobles and allies to discuss a solution. Native Tamir orcs offered to send scouts who would infiltrate the approaching army and monitor their movements from within. Light elves of Shanidal offered to meet the Green tide in the neck of peninsula where they successfully created several well-fortified outposts in case of a land invasion. Finally, a human arch mages, one of those who took part in the research of the Sol crystal, stepped forward and offered to put the dangerous artifact to use once more. This proposition quickly caught interest of an elven sorceress Siviana, who heard about the Sol crystal for the first time. The king was about to chastise the arch mage for disclosure of such information but have been quickly reminded about the exceptional severity of the situation. And since Siviana was well known as a master of destructive fire magic, the choice was made in her favor. When Siviana received the instructions from the human arch mage he warned her that during their testing of Sol crystals possibilities they only used simple, weak spells. No one knew what would happen if a top tier spell would be cast under its infusion. Siviana accepted the risk and considered the Green tide as the perfect subject for such experiment. After receiving the full information from the research, she made her way towards the Tamir peninsula neck, to the first line of fortifications and remained there till the Green tide appeared on the horizon. What happened next surpassed any imaginable expectations. Seeing an endless wall of green-skinned invaders before her Siviana infused her already massive energy pool with Sol crystals’ energy. 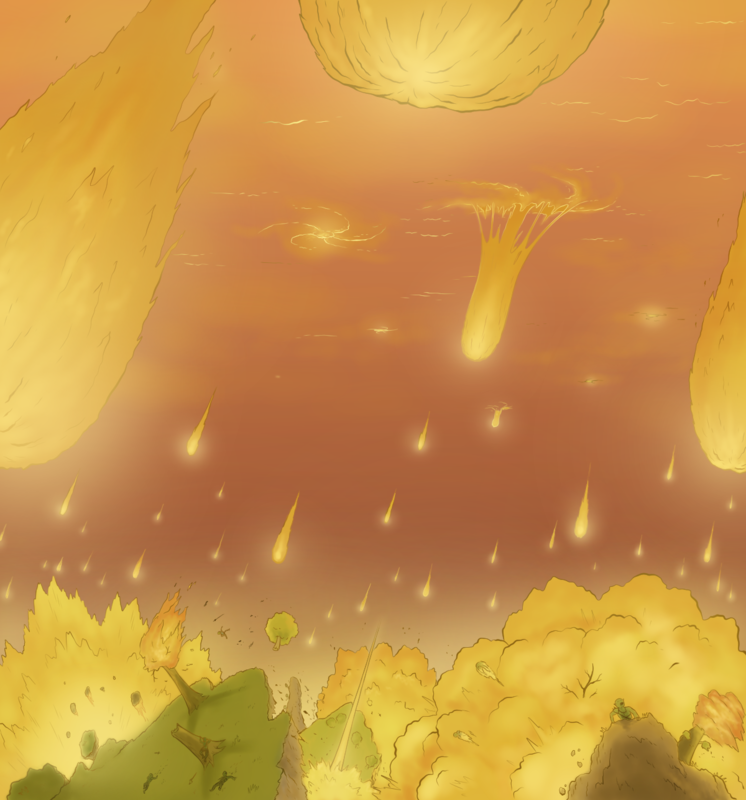 The spell she used was rain of fire, which could be casted on high distance and covered an already large area. But instead of appearing over the Green tide, the entire sky turned red and colossal rifts of magma emerged all over the land. Huge molten comets poured down and engulfed the land in flames and explosions. That day the neck of the peninsula turned into a series of shattered islands and Tamir became an island. The entire Green tide as well as defenders of Tamir perishes in just a few minutes. This event will be forever known as the Day of burning sky. Sol crystal saved Tamir kingdom but at a high price. Siviana and every defender who died in the sea of fire became national heroes. But for those who knew about Sol crystal’s ability to withstand damage, it was not the end – they suspected that the crystal could still be out there and it had to be found before it would get into wrong hands. Many months of intense search on the bottom of the sea around the area where Siviana’s outposts used to stand yielded an unexpected result. The Sol crystal have been found… but only in fragments. It is unknown how many fragments have been found and if all of them were recovered. First the royal magicians thought that it was destroyed but further examination showed that each fragment was still functioning, but with lesser potency. That day a new theory was born. A breakthrough which was too important to hide from the world, and so the sum of the knowledge about Sol crystal and its shards have been passed to the scientific societies of other kingdoms of Karandia. It was concluded that the Sol crystal shattered because Siviana overloaded it, not because it was caught into the destruction of the fire magic. Every obtained shard was fully functioning on their own, that’s why a suspicion was made that the Sol crystal could’ve been used by Kern or someone who owned it before him to create the anomalies of Karandia. Sol shards also refused to reattach, no matter what methods the researchers tried. Some researches who analyzed the Sol crystals’ appearance even made an interesting addition to the theory - that Sol crystal that they were studying could in fact be also a fragment. A fragment of an even larger, more powerful body. One can only guess what the original, whole artifact could do.